Being born in winter and spring is considered one of the most robust epidemiological risk factors for schizophrenia. The aetiology and exact timing of this birth excess, however, has remained elusive so far. Since during phylogeny, Borrelia DNA has led to multiple germ-line mutations within the CB1 candidate gene for schizophrenia, a meta analysis has been performed of all papers on schizophrenic birth excesses with no less than 3000 cases each. All published numerical data were then plotted against the seasonal distributions of Ixodes ticks worldwide. In the United States, Europe and Japan the birth excesses of those individuals who later in life develop schizophrenia mirror the seasonal distribution of Ixodes ticks nine months earlier at the time of conception. South of the Wallace Line, which limits the spread of Ixodes ticks and Borrelia burgdorferi into Australia, seasonal trends are less significant, and in Singapore, being non-endemic for Ixodes ticks and Lyme disease, schizophrenic birth excesses are absent. At present, it cannot be excluded that prenatal infection by B. burgdorferi is harmful to the implanting human blastocyst. The epidemiological clustering of sporadic schizophrenia by season and locality rather emphasises the risk to the unborn of developing a congenital, yet preventable brain disorder later in life. Microorganisms, including bacteria , are capable of transferring part of their genome into mammalian germ lines , and such exchange of foreign DNA has been suggested to be of mutual evolutionary advantage . The Lyme disease spirochaete Borrelia burgdorferi, in particular, disposes of a unique molecular mechanism of penetrating into germ-line cells of its host, whose genes the intracellular pathogen exploits like a virus owing to its own incomplete genome . Although countercurrent to established views, the neurotropic spirochaete has integrated parts of its genes into our germ line, these serving as putative templates for further recombination. If prenatal exposure to such phylogenic traces of foreign DNA reoccurs during ontogeny, a novel type of infectious mutation would occur within the 3' 'hotspot' for pathology of the human cannabinoid receptor gene CB1 [5–7]. The genetic expression of CB1  would subsequently be affected in exactly those areas  that mirror the structural  and functional  brain abnormalities in schizophrenia. Following the identification of neurosyphilis, caused by the spirochaete Treponema pallidum, that led Kraepelin  to recognise the distinctive pattern of dementia praecox as a disease entity, Bleuler  coined the term 'schizophrenia'. Although this 'break' between reality and 'thought' is characterised by a multiplicity of signs and symptoms, the highly prevalent illness is recognised throughout the world, and there is now international agreement on its classification. Apart from known infectious diseases, no other affliction exhibits an equally marked seasonal distribution, thus nurturing the hope that schizophrenia could ultimately be preventable. Although Hippocrates (460 BC) recognised the importance of "the seasons of the year and the effects they produce ... being common to all countries as well as peculiar to each locality", psychiatrists have been slow to accept this idea. Systematic research into the season of psychiatric birth effects began only with the studies by Tramer  and Lang  after the turn of the last century. Despite methodological problems, including some cases of neurosyphilis within the ill-defined Swiss cohort, their findings could be widely replicated. Being born during winter and spring is nowadays considered one of the most robust epidemiological risk factors for sporadic schizophrenia. The cause and exact timing of this birth excess, however, has remained elusive so far . Clinically, syphilis, which has long been associated with devastating congenital outcomes, resembles Lyme disease. Like in humans , however, overt chronic infection of the unborn by Borrelia burgdorferi is rare in mice, as placental transmission of this spirochaete is restricted to an exclusively narrow time window at conception . The present study is therefore focused on the seasonal distribution of schizophrenic birth excesses relative to Ixodes tick activity worldwide – with a time lag expected to be nine months apart. Otherwise, the hypothesis of B. burgdorferi being a major aetiological factor for congenital sporadic schizophrenia would be falsified. For statistical reasons, only publications encompassing more than 3000 cases of schizophrenic birth excesses compared to the normal population have been considered . These include two studies from Denmark and Australia showing both one significant and one non-significant result each, whereas the birth excesses of the remaining studies were all statistically significant. From the comprehensive literature, significant numerical data allowing for seasonal comparison were then used in this meta analysis and plotted against the published data of B. burgdorferi transmitting Ixodes tick activity (or numbers per area) of the respective macroclimatic regions. In the USA, Ixodes scapularis ticks exhibit a clearly defined periodicity, increasing their numbers under specific macroclimatic conditions from March to April, in June and October . The seasonal distribution parallels the birth excess for schizophrenia nine months later , while the risk of developing schizophrenia is reduced towards a global decline in November. It is to be noted that the deficit of schizophrenic births in late autumn occurs throughout the world and correlates with the lowest number and activity of Ixodes ticks in wintertime nine months earlier. As in Europe, the spring peak of tick activity in the USA with a first climax in March  correlates with the rising numbers of schizophrenic births between December and January. In the Far East, the unimodal peak of Ixodes persulcatus from April to July  reflects the unimodal winter-spring birth excess in Japan followed by a relative decline of schizophrenia in May . The distribution of schizophrenic births across Europe [14, 15, 23, 24], by contrast, mirrors the more complex seasonal concentration of tick populations, separated by a midsummer decrease in humidity . In Ireland, where the maritime climatic conditions remain relatively mild throughout the year, nymphal activity continues into midsummer followed by a smaller peak in early autumn. Although this bimodal pattern remains evident, it resembles the moderating environmental effects on the life cycle of the tick Dermatocentor variabilis. When the adult ticks emerge from nymphs fed in the same year, they tend to surge towards a midsummer peak from early May to August, overlapping with the older cohort of adult ticks in autumn . In Ireland, this fusion into a more uniform pattern of midsummer Ixodes ricinus activity  might therefore account for the somewhat delayed, but pronounced schizophrenic birth excess in spring . While in central Europe a few autumn-feeding I. ricinus ticks are active up to October , the temperature falls below zero in Finland. Like in the Alps, the minimal mean temperature of seven degrees required for tick activity  allows only one summer peak in northern Europe, including the Karelian border between Russia and Finland . The seasonal periodicity of I. ricinus, in turn, reflects the typical unimodal schizophrenic birth excess in Finland  and Denmark . The harsh weather conditions in the north might furthermore reflect the stochastic fluctuations  of ticks in Scandinavia  and possibly schizophrenic births in Finland . Due to the central European midsummer decrease in air humidity and thus reduced tick activity , the relative decline towards a schizophrenic birth deficit in April appears earlier and more pronounced the further south we move. See Switzerland  and Germany  in figure 1. Seasonal correlation of sporadic schizophrenia to Ixodes ticks The seasonal periodicity of the adult and juvenile stages of Ixodes scapularis in the State of New York  exactly mirrors the dynamics of schizophrenic births in the north-eastern United States . The spring and autumn populations of Ixodes ricinus in central Europe are affected by microclimatic conditions and a drop in humidity in midsummer (a = exposed meadow, b = dense hill vegetation or secondary deciduous woodland, c = highly sheltered habitat, d = spring-derived but autumn-feeding cohort). In northern Europe, however, there exists no late autumn cohort (d) as tick activity comes to a halt due to falling ambient temperature. Data adapted from [14, 15, 19, 23, 24]. The seasonal distribution of Ixodes persulcatus ticks in the Far East  appears to have given rise to schizophrenic births between February and March along with the typical decline in summer and late autumn . In the case of a prenatal infection at the time of conception, nine months later these variables run parallel to the birth excess number of individuals with schizophrenia. In Singapore, by contrast, the non-significant birth excess in schizophrenia  is in line with the apparent absence of Ixodes ticks and B. burgdorferi from that part of the world . That exposure precedes infection is self-evident. Like other environmental causes, however, this relation is also expected to show a correlated biological gradient . In maritime Ireland and the sheltered microclimatic environment at the foot of the Swiss Alps, for example, tick abundance and the transmission of three pathogenic species of B. burdorferi sensu lato[19, 30, 31] coincide with the highest rates of schizophrenic births worldwide (see figure 1). Lower tick concentrations and infection rates by B. burgdorferi sensu stricto appear to score relatively lower rates of schizophrenic birth excesses in the United States . 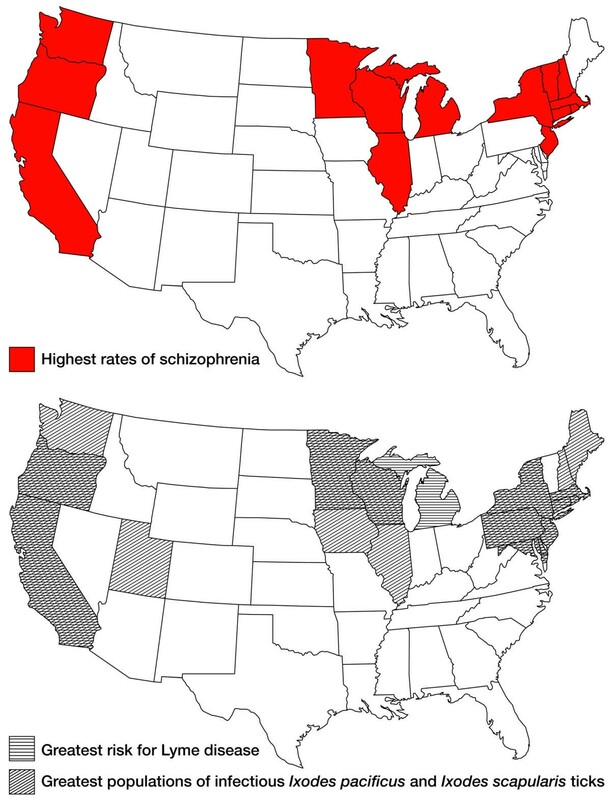 Within the USA (see figure 2), however, the Pacific Coast, New England and Great Lakes states score an approximately three times higher rate of schizophrenia compared to other states . Schizophrenic birth excesses, in particular, are more pronounced in New England and the Midwest than in the South . This trend, which has been remarkably consistent over a long period, correlates with the highest risk of Lyme disease and the largest populations of Ixodes ticks in the USA [34–37] (see figure 2). Geographical correlation of schizophrenia to Ixodes ticks and Lyme disease in the USA The epidemiological correlation between Ixodes ticks and schizophrenia originally published by Brown  has been adjusted according to the more recent epidemiological data on the risk of Lyme disease including zooprophylaxis [35–37, 55]. Contrary to current belief , neither the incidence nor the winter-spring birth excess of schizophrenia occurs at a constant, global rate. The risk of schizophrenia  actually reflects the uneven distribution of B. burgdorferi endemicity worldwide . South of the Wallace Line, which limits the spread of Ixodes ticks by mammals into New Guinea and Australia , seasonal schizophrenic trends are less significant compared to the northern hemisphere . In Singapore, which is still a non-endemic area for Ixodes ticks and B. burgdorferi, there is no significant schizophrenic birth excess . One of the greatest triumphs of epidemiology stems from the control of cholera before the responsible organism, let alone its mechanism of action, had been identified. Major progress in prevention is thus possible by focusing on those variables that are known and can be influenced. Although the concept of cause is the source of much controversy, as it is in other sciences, a correct temporal relation between exposure and effect is essential in epidemiology . Like in other parts of the southern hemisphere , polar birds travelling from the northern hemisphere sporadically via the Antarctic introduce Ixodes uriae ticks harbouring Borrelia garinii into Australia. These, in turn, may infect people in New South Wales  and adjacent coastal areas. However, B. burgdorferi could neither be detected in , nor experimentally be transmitted by  the endemic species Ixodes holocyclus. Such maladaptation to local tick vectors might account for the low incidence of borreliosis and thus the reportedly lower rate of schizophrenia in New South Wales  and other parts of Austronesia . In the remote interior of New Guinea, on an island which is reportedly non-endemic for Lyme disease , schizophrenia appears to be almost non-existent . In a neuropsychiatric survey comprising more than 10,000 Papuans from the Indonesian part of New Guinea , we found only one overtly psychotic case that had recently arrived from his home town Merauke on the western coast. In the interior of Papua New Guinea, schizophrenic prevalence is also much lower than expected . Yet in the western coastal districts, where migratory birds are known to introduce ticks from New South Wales and Queensland [see ], and where Rusa deer (Cervus timorensis) originally imported by the Dutch abound, the prevalence of schizophrenia is significantly higher . Migratory sea birds are also known to introduce I. persulcatus and B. garinii from their origin on the Eurasian mainland into pockets of northern Japan [51, 52]. As in Australia, however, the risk of acquiring Lyme disease is relatively low, since the spirochaetes have not yet fully adapted to the local Ixodes ovatus ticks. In contrast to I. persulcatus, this endemic tick species found all over Japan is only capable of acquiring but not transmitting B. garinii to its human hosts . From that perspective, the relatively recent introduction of B. garinii might possibly explain the recent rise of schizophrenic birth excesses in Tokyo after the turn of the last century . Residential development favours small tree-enclosed meadows interspersed with strips of woodland, much prized by deer, hedgehogs, mice and cats. The widely reported correlation of schizophrenic birth excesses to more densely populated urban and suburban areas  might thus reflect the activity of ticks, now attacking people in metropolitan areas . At first sight this phenomenon might appear counterintuitive. Yet, while deer play a crucial role in the development and recent geographical dispersal of adult ticks [32, 35, 54], their spirochaetocidal antibodies exert a protective effect by clearing the borrelia from the questing ticks' endolymph. Thereby the ticks lose their infectious potential for human beings living in the countryside . This so-called zooprophylactic effect particularly applies to the southern United States, where ticks feed abundantly on lizards and skinks which poorly maintain B. burgdorferi infection . Compared to southern states such as Mississippi, where lizards are endemic, by contrast Michigan poses a relatively higher risk for Lyme disease despite the relative scarcity of ticks in that state. Due to the continuous peridomestic parcellation of nature, hedgehogs (Erinaceus europaeus) also abound as excellent hosts for Ixodes nymphs as well as the particularly dangerous adult Ixodes ticks (personal observation). What is worse, their apparent lack of zooprophylaxis contributes to the periurban transmission of borreliosis  in our gardens. In peridomestic sites, various mice, Peromyscus leucopus in eastern North America and Apodemus agrarius in Europe, are the most important reservoirs of B. burgdorferi infection [30, 32]. As cats go for these mice, they reportedly spread Ixodes nymphs near or in households (see ]. Not surprisingly, therefore, there is significantly more often a cat in the household at the time of birth of an individual who later develops schizophrenia . The nine months' interval between tick activity and schizophrenic birth excesses implies an infection at conception or shortly afterwards. It is tempting to speculate that a mutagenic interaction between the implanting blastocyst and pathogen depends on the simultaneous epigenetic exposure of both embryonic and microbial DNA reading frames  – weeks before neurons differentiate and embryonic brain development sets in. As ontogeny reflects phylogeny, the fast-switching ionotropic neuroreceptors dominate in the adult mammalian brain, whereas earlier in life and evolution the slow metabotropic neuroreceptors appear during implantation as critical elements in intercellular signalling before neurons differentiate . There exists only one metabotropic neuroreceptor gene implicated in both schizophrenia [8, 60, 61] and embryonic implantation : the CB1 cannabinoid receptor gene. Likewise, within human CB1, the phylogenic trace of a microbial virulence factor, the flagellar basal rod protein originating from B. burgdorferi, cannot be entirely coincidental, since this foreign DNA codes for spirochaetal intrusion into foreign tissue as well. For successful implantation into foreign tissue, and in order to suppress HLA mediated antigen presentation to maternal tissue , the implanting embryo secretes interferon gamma . Worse still, interferon gamma also up-regulates the molecular machinery of genetic recombination and variation by B. burgdorferi. Through this cytokine mediated mutagenesis, the co-expression and genetic exposure of both embryonic and spirochaetal DNA coding for foreign intrusion has arguably led to the germ-line mutations of our ancestral CB1. In the course of evolution, exposure of complementary DNA templates has furthermore led to genetic recombination with other loci whose distribution is not entirely random. Rather, the chromosomal scatter of the respective spirochaetal nucleotides presents surprising explanatory power for some schizophrenic linkage and genetic coincidence studies that have remained so far unaccounted for . Lyme disease is easily missed in psychiatry [66–69]. The case report of a 19 year-old patient suffering from neuroborreliosis is perhaps the most illuminating. He presented at the Department of Psychiatry in Munich (Germany) with acute catatonic and paranoid symptoms including negativism, stereotyped movements, delusional ideas of persecution as well as acoustic hallucinations. Upon isolation of B. burgdorferi from the CSF and the demonstration of intrathecal IgG antibodies, the patient completely recovered after antibiotic therapy . However, this type of adult-onset, schizophrenia-like encephalitis – which closely resembles the cataleptic symptoms of CB1 knockout mice  – is rather the exception to the rule. In the United States, from where the highly neurotropic B. garinii is absent, a search for antibodies in schizophrenic patients has, compared to normal controls, yielded negative results (Torrey, 2001; unpublished data). In the Czech Republic, however, a subtle, yet significant correlation between elevated antibody titers against B. burgdorferi and schizophrenia has recently been demonstrated . Prenatal infection restricted to parts of the fetal brain always results in a brain disorder, whose severity depends on the proportion of neurons involved. Like neuroborreliosis, sporadic schizophrenia therefore appears to be characterised by an excess of focal neurological damage . If the mutation also affects germ-line cells, initiating familial schizophrenia in the offspring of the next generation (born at any season throughout the year), all neurons will be affected. The phenotype of disordered integrative functions is then expected to be more severe. In familial schizophrenia, this is in fact the case . Conversely, attempts to correlate the schizophrenic birth excess with its symptomatology have yielded a negative family history and, more specifically, a lesser severity of illness . At present, it cannot be excluded that sporadic prenatal infection by B. burgdorferi poses a psychiatric hazard to the unborn. On the contrary; the epidemiological clustering by season and locality, being characteristic of an acute contagious disease , rather points to a causal relation between global Ixodes tick endemicity and sporadic schizophrenia.